​The park covers an area of 13,600 hectares. At present, 2,000 hectares of core areas have been planted. ​The prefecture plans to set up 36 modern agricultural demonstration parks, among which provincial key parks account for 20. ​With a planned area of 31.6 square kilometers, the industrial park consists of several industries. ​The industrial park occupies an area of 40.59 square kilometers. The layout of the industrial park is arranged in the following way. The park sits northwest of the Qianxinan city of Xingyi, about 20 kilometers away from the downtown area. ​The park covers an area of 39 square kilometers. It consists of Baling and Luguan areas. ​The park integrates electronics and communication, food processing, packaging and apparel, new energy and materials, light assembly, automobile and motorcycle production, logistics, commerce and trade, residence, and storage. 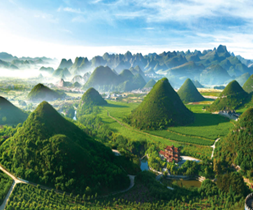 ​The park was approved by the Guizhou government in 2011 and had a planned area of 7.9 square kilometers in 2015, including 6.30 square kilometers as construction land and 4.64 square kilometers for industry.